excellent! Thanks for sharing :-) I wrapped all my christmas presents with those bows all because of your instructions! 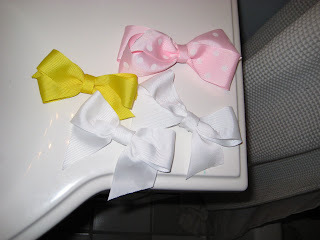 Now, when Caroline gets hair I can make her hair bows! Hope you have a merry christmas! Cute, Cute, Cute!!! I am already wanting a grandbaby like all my friends and you just made it worse! Those bows were costly-er back in your day because I made them the size of your head. Remember Sue's wedding? All you could see were 3 bow head flower girls coming down the aisle! Sorry for all the headaches you must have had supporting those massive bows! The problem with those bows were the huge branches sticking out of them, not the bows themselves. And trust me, I wanted to make these bows bigger. And easy on the g-word, please.